Toyohara Kunichika (1835-1900) Scenes of Famous Places Along the Tokaido Road Station 77: Tenryugawa, 1863. Oban. Kunichika’s work of this period is scarce - as are his rare forays into landscape. 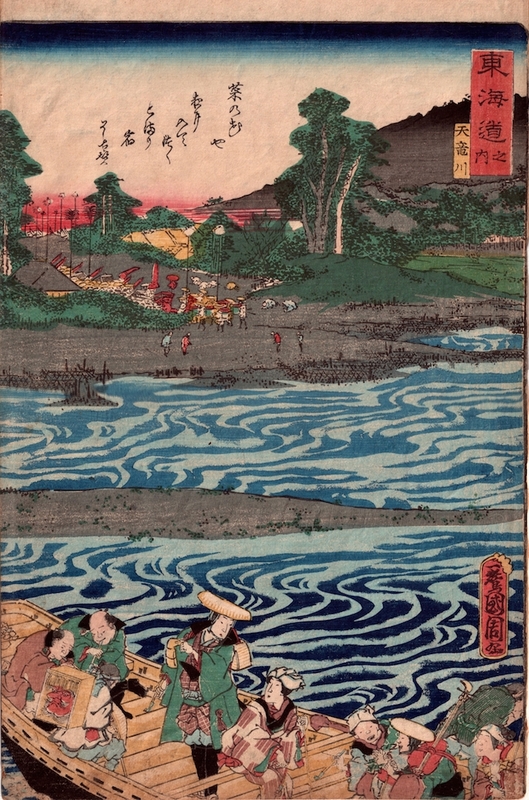 Kunichika was still attending Kunisada’s Kameido studio at the time but was also being influenced by Kunisada’s colleague and rival Kuniyoshi - evident in the swirling motifs of the water taken directly from the Kuniyoshi triptych Xuande Leaping into the Gorge of Tan. In his print, Kunichika populates the foreground with figures in a boat, set against the swirling waves of the seashore. The 250 year-old Tokugawa Shogunate was on its last legs: the enforced opening of Japan’s borders in 1854, followed by famine and crop failure and a collapsing economy had fatally weakened the Shogun’s power. He would lose authority to the Emperor just two years after this series was completed. As a sign of weakness and a poor grasp on power, the Shogun determined on a procession from the political capital Edo to the Imperial capital, Kyoto. In an unprecedented step, the authorities commissioned a woodblock series from fifteen of the leading ukiyo-e artists of the time - I think that this must be the first officially commissioned print series of all time. Artists included Hiroshige II, the aged Kunisada, Sadahide, the young Yoshitoshi and the young Kunichika among others. This one series brings together the artists of the Utagawa School in one quite unique effort. From an art historical point of view, the fascinating aspect of all the prints is their homogeneity - despite the widely differing generations and individual styles it is very hard at times to distinguish between say, the work of the youthful Yoshitoshi and Kunisada, now in his 78th year. The prints in the series are notable for their high quality of production, but also the strong visual imagery used. Many, such as this one are graphically very inventive and there seems to be a clear, common effort to use the best possible motifs for each of the images. A notable feature is the presence of the processing Shogun and his vast retinue, visible here in the mid-foreground, which gives the series its common name of The Processional Tokaido. A rare print from early in Kunichika’s career. Trimmed on three sides as is common with the series, otherwise colour, condition and impression are all fine. Signed Itto Kunichika ga, published by Iseya Shonosuke.